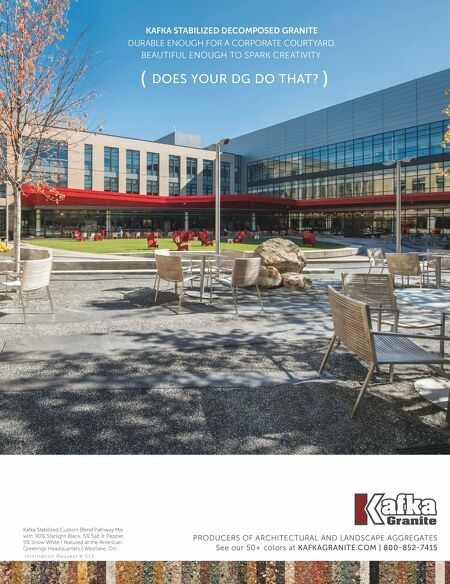 8 Landscape Architect and Specifier News Find it First in LASN! There are 64 advertisements or product releases in this issue where the picture or ad has never before been published, what LASN calls "World Premieres." Look for the World Premiere icon in the Product Focus section (pages 24-27) and in red text the Ad Index (pages 113-114, 117-118). Contact LASN for more information on how your new product can be in the World Premiere spotlight! 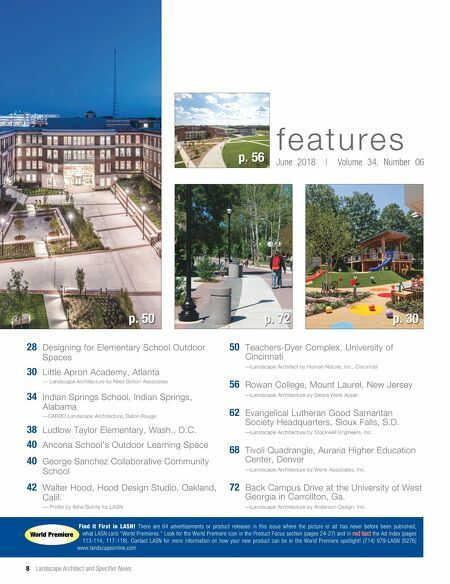 (714) 979-LASN (5276) www.landscapeonline.com World Premiere p. 72 p. 50 p. 30 p. 56 June 2018 | Volume 34, Number 06 f e a t u re s 28 Designing for Elementary School Outdoor Spaces 30 Little Apron Academy, Atlanta — Landscape Architecture by Niles Bolton Associates 34 Indian Springs School, Indian Springs, Alabama —CARBO Landscape Architecture, Baton Rouge 38 Ludlow Taylor Elementary, Wash., D.C. 40 Ancona School's Outdoor Learning Space 40 George Sanchez Collaborative Community School 42 Walter Hood, Hood Design Studio, Oakland, Calif. — Profile by Ifsha Buttita for LASN 50 Teachers-Dyer Complex, University of Cincinnati —Landscape Architect by Human Nature, Inc., Cincinnati 56 Rowan College, Mount Laurel, New Jersey —Landscape Architecture by Sikora Wells Appel 62 Evangelical Lutheran Good Samaritan Society Headquarters, Sioux Falls, S.D. —Landscape Architecture by Stockwell Engineers, Inc. 68 Tivoli Quadrangle, Auraria Higher Education Center, Denver —Landscape Architecture by Wenk Associates, Inc. 72 Back Campus Drive at the University of West Georgia in Carrollton, Ga. —Landscape Architecture by Anderson Design, Inc.